The Sulphur-crested Cockatoo is a parrot that is found mainly in the northern and eastern areas of Australia, including Tasmania, and in New Guinea and the Aru Islands, and has been introduced to the Perth area of Western Australia as well as New Zealand and Indonesia. 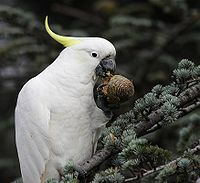 Sulphur-crested Cockatoos in the wild in urban areas have become a nuisance, as they use their strong beak to destroy timber decking and panelling on houses. In rural areas, they are a pest for farmers of grain, fruit, and nut crops and in Western Australia are a declared pest., They also emit a loud screeching sound, which has been described as like someone being strangled. They have been observed in flocks of up to 100 birds. Sulphur-crested Cockatoos are popular pets, can live for 100 years in captivity, and will often bond with one person. Australian Museum, Sulphur-crested Cockatoo, 2003. Australian Museum, Sulphur-crested Cockatoo Fact File, 2007. Department of Agriculture, Western Australia, Sulphur-crested cockatoo Farmnote 86/2001, 2001. This page was last modified on 24 June 2016, at 18:16.